When the garbage at your building or facility consistently exceeds capacity, or you have items that are too large to put out on the curb, D.B. Container Service is the trusted source for roll off dumpster services in the region. We offer dumpster rentals in Manhattan in a broad range of sizes based on your particular requirements. Whether you're the landlord of a residential complex or you're searching for a commercial or industrial solution, we'll help you find the container rentals you need. For nearly two decades, we've been building long-term relationships with our customers by delivering quality products and services you can trust. From helping you choose the right dumpster rentals to our fair and honest prices, our goal is to help your maintenance and waste removal operation flow smoothly and efficiently. 10-yard containers: Excellent for small interior remodeling projects, apartment and basement cleanups and residential garbage collection. 15-yard containers: Ideal for medium-sized home refurbishings such as kitchens as well as small construction and excavation jobs. 20-yard containers: Offer the capacity to handle debris from roofing and siding projects, garage construction or window and deck replacement. 30-yard containers: Great for totally renovating houses, large construction sites, commercial cleanups and shed and garage demolitions. Who Rents Our Roll Off Dumpsters? D.B. Container Service offers garbage storage and pickup solutions for a variety of people and industries in Manhattan and the surrounding areas. We are fully equipped to handle jobs of all sizes and scopes, from a one-time pickup for a homeowner replacing appliances to regularly scheduled roll off dumpster services at multiple job sites. Home renovations and construction projects are a significant source of demand for our dumpster rentals in Manhattan. Rather than having to bag garbage and debris individually, your work crews can keep productivity humming by simply tossing trash into our large rental containers. Whether you're building a new home, clearing out a garage or attic, or replacing roofing or flooring, our experienced team will assist in analyzing your needs to identify the 10- to 30-yard containers suited to your specifications. D.B. 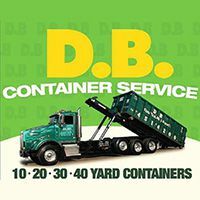 Container Service specializes in providing fast and easy dumpster rentals in Manhattan, Brooklyn, Queens and throughout the region. We've been proud of our reputation for treating our customers with honesty and integrity since 2001.